If you can't get women to buy deodorant because they want to smell nice, try threatening their jobs instead. That seems to be the upshot of a new scientific study, commissioned by Procter and Gamble, suggesting that women who smelled like sweat were evaluated as less competent and trustworthy by other people. We already know that people do pick up information about each other, often unconsciously, from body odors. Some studies suggest that we can gauge each other's fitness and health with a few whiffs. 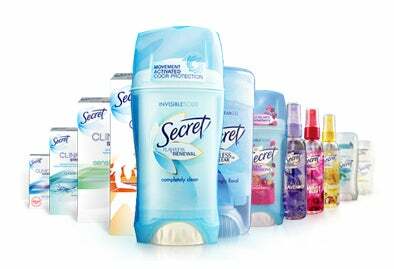 But Proctor and Gamble, makers of popular women's deodorant Secret, wanted to know if smells could influence social and professional relationships. So they paid some researchers to find out. In the current study, we tested whether axillary odors obtained from women experiencing psychosocial stress could negatively influence personality judgments of warmth and competence made about other women depicted in video scenarios. The researchers showed groups of over 100 men and women a series of short videos where women were doing ordinary activities, including working, home making, and childcare. As they watched, the men were instructed to sniff pads soaked in sweat that had been gathered from 44 women in stressful situations, as well as non-stress sweat gathered during exercise. They also sniffed sweat that had been treated with deodorant. Note the reserachers, "Women in the video scenes were rated as being more stressed by both men and women when smelling the untreated vs. treated stress sweat." This didn't seem to affect the women's judgment of the sweaty women, but the men had fairly strong negative reactions to both the stress sweat and the non-stress exercise sweat. "For men only, the women in the videos were rated as less confident, trustworthy and competent when smelling both the untreated stress and exercise sweat in contrast to the treated stress sweat," the researchers write. But the "treated" sweat, which had been spiked with deodorant, elicited no negative reaction. "The results have implications for influencing multiple types of professional and personal social interactions and impression management," the researchers conclude. Fair enough. Now we know that men may think that their female colleagues are less competent if they are sweaty. But here's the kicker. The researchers found that these negative impressions could be reversed if women simply wore deodorant. Overall, the most significant differences were found when comparing ratings made in the presence of sweat from the untreated axilla to those made in the presence of sweat collected from the [deoderant-] treated axilla, where a commercial, unscented anti-perspirant product was used to see if it could effectively block the stress sweat signal. The ability of chemosensory signals of psychosocial stress to influence social judgments of other individuals has important implications for both professional and personal interactions and relationships . . . As a distal sense capable of communicating information across space, it is also likely that airborne communication of stress signals can bias or otherwise predispose an individual to interpret other forms of interactions negatively. So let's get something straight, ladies. Science has offered you evidence that if you don't wear deodorant, the men around you will like you less and think that you are less competent at your job. Maybe you should buy some deodorant? But who should you buy it from? The study was funded by a commercial source: Proctor & Gamble Beauty. Nonetheless, the funders had no role in study design, data collection and analysis, decision to publish, or preparation of the manuscript. Strangely, even though the funders had no role in study design, this study still wound up exploring whether deodorant could help women make a better impression on men. I guess that's just one of those weird coincidences.